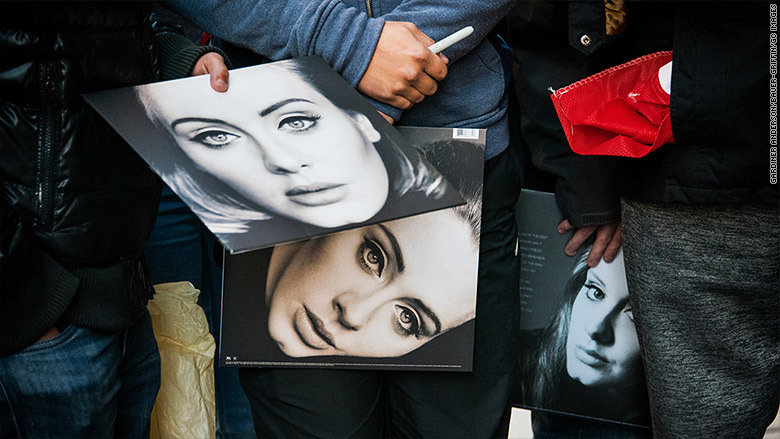 Adele is breaking hearts and records. The British artist's latest album "25" sold 2.43 million copies in a little over three days surpassing the single-week sales record of *NSYNC's "No Strings Attached" which sold 2.4 million copies in 2000. Adele's "25" also became the top-selling album of 2015 overtaking the 1.7 million copies of Taylor Swift's "1989." "As these numbers continue to grow with every day it becomes more and more apparent that Adele is at a level achieved by no other artist," said David Bakula, senior vice president of insights at Nielsen Music. The sales week ends on Thursday and music industry analysts are projecting that Adele could sell upwards of 2.8 million to 2.9 million copies for her first week. The album "25" is the follow up to her 2011 breakout album "21" which won multiple Grammys including Album of the Year and had sales of more than 11 million. Adele made news last week when the artist wouldn't allow the album to be on any streaming service including Apple Music and Spotify. "25" is Adele's third studio album, which followed other numerical named albums "19" and "21."